Why Develop a Proton Battery? With more improvements and modifications, the rechargeable proton battery developed at RMIT University has the potential to store much larger amount of energy than the currently available and widely used lithium-ion batteries. If scaled up, the technology can be applicable for medium-scale storage on electricity grids and for fueling electric vehicles. It can also be utilized as energy storage of solar photovoltaic panels for households just like the Tesla “Power wall” which uses lithium-ion batteries. The RMIT University researchers have shown in their study that the proton battery they have developed is already storing energy of amount (per unit mass) comparable to commercially available lithium-ion batteries even though it has an active internal surface area of only 5.5 square centimeters. This means that with further modifications to improve its active surface area and optimize other parameters, its storage capacity would surpass those of lithium-ion batteries. Its current maximum cell voltage was reported to be 1.2 volt. “A major potential advantage of the proton battery is much higher energy efficiency than conventional hydrogen systems, making it comparable to lithium ion batteries. The losses associated with hydrogen gas evolution and splitting back into protons are eliminated,” writes RMIT University on its official website. RMIT’s prototype proton battery is also environmentally friendly. “Our latest advance is a crucial step towards cheap, sustainable proton batteries that can help meet our future energy needs without further damaging our already fragile environment,” lead researcher Professor John Andrews said. The proton battery is composed of two parts: (1) a carbon electrode that stores hydrogen or protons from water and (2) a reversible fuel cell that generates electricity from the hydrogen. According to Andrews, the carbon electrode and the protons from water give the proton battery its environmental, energy, and potential economic edge. As the battery operates just like a hydrogen fuel cell, the carbon in this proton battery does cause emissions in the process, unlike in petroleum-based fuels. “As the world moves towards inherently-variable renewable energy to reduce greenhouse emissions and tackle climate change, requirements for electrical energy storage will be gargantuan,” added Andrews. “Carbon, which is the primary resource used in our proton battery, is abundant and cheap compared to both metal hydrogen-storage alloys, and the lithium needed for rechargeable lithium ion batteries,” explains Andrews on the sustainability and cost-effectiveness of their proton battery. 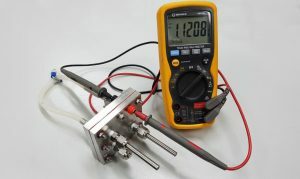 RMIT University’s proton battery can be described as a hybrid of hydrogen fuel cell and battery-based electrical power. It combines the aspects of the two said technologies such that it uses a carbon electrode for solid-state storage of hydrogen and uses a reversible fuel cell to provide an integrated rechargeable unit. During charging, the reversible fuel cell component of the battery splits water with the help of electrons from the power supply. This generates hydrogen ions or protons, which subsequently bonds with the carbon electrode – the energy storage material – and thus, prohibiting the formation of hydrogen gas. To generate electricity, the above process is reversed. The hydrogen atoms stored in the carbon electrode are released and lose an electron to become protons again. These protons then pass back through the reversible fuel cell, wherein they bond with oxygen from air to form water and finally, generate power. Your Fingertips Could Power Your Laptop! New Fuel Battery Has 3 Times More Energy Than Gasoline!